All flowering plants have _____ life cyles which include distinct stages. When seeds are dispersed from the parent plant they can either lay _____ immediately given the right conditions. 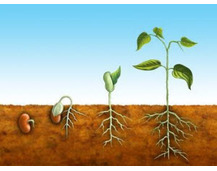 the early stage of plant growth is called _____ where seeds are dormant or grow. During germination roots begin to grow _____, while stems and leaves grow _____. Over time the seed grows into a _____ with the structures necessary to produce more plants. _____ occurs when pollen transfers from stamen to pistil then enters the ovule. _____ is produced in the anther of the stamen of a flower. Once the ovule is fertilized it develops into a _____. A _____ (fleshy, pod or shell) develops to protect the seed. Seeds are structures that contain the _____ surrounded by a protective covering.